Therefore, it is necessary to contain these ubiquitous devices in cell phone storage lockers to prevent them from equally tempting both owners and thieves. Cell phone storage lockers can either mount on top of a shelf or surface mount to a wall. In reality, they can be used to store far more than cell phones. Many places use them to give their clients or employees places to store keys, wallets, cameras, tablet PC’s, and jewelry. 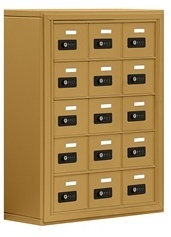 Cell phone lockers are constructed of aluminum and come in five configurations. Users access the locker compartment by entering a combination. Managers can access compartments with master keys that can override the combination locks. High traffic organizations such as public gymnasiums can better serve their clients by providing them with a place to store their cell phones and personal valuables. This extra bit of security can be good advertising for the organization and lead to new memberships. Office buildings are investing in cell phone lockers to protect their production. Ever since people had phones on their desks, there has been abuse of company time going on in the form of personal conversations. Then email came along and made such communication silent and more difficult to monitor. Now texting on tiny keypads is even more under the radar than any of the above—and more of a threat to work ethic and general productivity. The solution is to tap the phone, monitor email, and to lock the cell phone up in a cell phone storage locker. It won’t go anywhere, and it won’t cost the company any more money once the locker is paid for. It is for similar reasons now that schools are beginning to put cell phone lockers in every classroom. This is because most students bring cell phones to school. Like their parents, they insist that they must have the phone with them at all times for emergencies. Like their parents, they end up texting more than paying attention to what is in front of them. It saves the student a great deal of lost learning time, and it saves the school a great deal of hassle in confiscating the phone, to simply put the phone in a locker and let the student take it with him or her when the bell rings. It is clear from all of this that cell phones often require management beyond that of the actual user. Cell phone lockers are the most practical means of regulating these devices and for keeping them safe from theft and damage. XPB Lockers carries a wide variety of steel metal lockers, commercial lavatories, USPS mailboxes, and stainless steel commercial restroom equipment delivered nationwide. If you can not find what you are looking for call us toll free at 1-877-483-9270 and we will find it for you. Our home office is located in New Braunfels, Texas with warehouses located throughout the United States that enable us to service all 50 states including New York NY, Los Angeles CA, Miami, FL. Chicago, IL. Denver CO., El Paso, Texas, Dallas TX, San Antonio, TX, Austin, TX, Boise ID, Atlanta GA, Albuquerque NM, Raleigh-Durham NC, Washington DC, Albuquerque NM, Huntsville AL, Fayetteville AR, Norfolk VA , Madison WI., Corpus Christi, TX, Plano, Texas, Garland, TX, Laredo, Texas, Lubbock, TX, Houston, TX. This article was published on Wednesday 29 June, 2011.